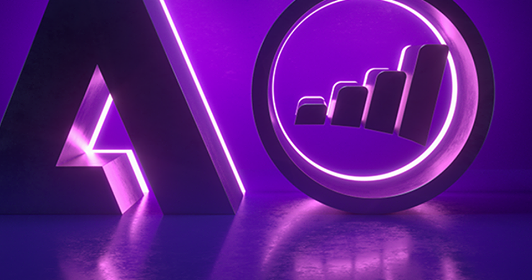 On September 20, 2018, the American multinational computer software company Adobe Systems, announced that it had entered into an agreement to buy the B2B marketing engagement cloud platform Marketo from Vista Equity Partners, in a transaction valued at approximately $4.75bn. Adobe Systems was founded by John Warnock and Charles Geschke in 1982 and today it is headquartered in San Jose, California. The company employs roughly 18,000 individuals and operates primarily through the segments of digital media, digital marketing and print & publishing, and licenses its products directly through its global sales force team and its online application stores. The most renowned services include Acrobat Reader and the Portable Document Format. In FY2017, the firm reported total revenues of $7.30bn, which represents a 24.7% increase compared to the previous year. Furthermore, Adobe Systems announced a net income of $1.69bn in the same period. The company reported a free cash flow of $2.70bn and diluted EPS of $3.38 in 2017, compared to $1.94bn and $2.32 in the prior year. The firm has historically been very active in terms of M&A activity. As a matter of fact, in May 2018, Adobe Systems purchased the e-commerce company Magento for $1.68bn while, in April 2018, it also acquired Sayspring, a start-up that allows consumers to design, construct and test voice applications. Marketo was founded by Phil Fernandez, Jon Miller and David Morandi in 2006. With nearly 5.000 employees and 500 partners, the firm provides a comprehensive range of engagement marketing services in the United States, Ireland, Australia, Israel, Japan, and the United Kingdom. The firm offers these services through distributors, agencies and resellers. The company completed its initial public offering in May 2013, and later purchased Israeli web personalization company Insightera for approximately $20m. However, in June 2016, Vista Equity Partners took Marketo private for $1.8bn. Throughout its existence, Marketo has received a variety of honors and awards. For instance, the company ranked 1st in the Gartner Magic Quadrant for CRM Lead Management for six consecutive years and achieved the 28th place in Forbes’ Most Promising Companies ranking. In the last fiscal year (FY2015) before Marketo was taken private, the firm’s annual revenues increased by roughly 40.0% to $209.9ml. In the same fiscal year, calculated billings totaled $238.9ml compared to $171.5mil in 2014. Additionally, total cash flow from operations amounted to $2.3ml and net loss per share (basic and diluted) was $1.68 in 2015. Besides a slowdown in 2015, the global software market, in which both Adobe and Marketo are active with leading roles, posted a consistent growth throughout the whole 2013-2017 period, as witnessed by the 2.4% CAGR. In absolute terms, 2017 market size settled at approximately $348bn. In order to effectively analyze the software industry, as well as understanding what are the most engaged activities within the market, it is useful to perform a breakdown of the market by category. When this analysis is carried out, five main market segments emerge: i) Enterprise Applications, ii) Enterprise Mobility Management, iii) Information Management, iv) Security Software and v) Software Infrastructure. More precisely, 2017 data show how the latter has been the largest segment, worth approx. 46% of the market, followed by Enterprise Applications, approx. 31%. 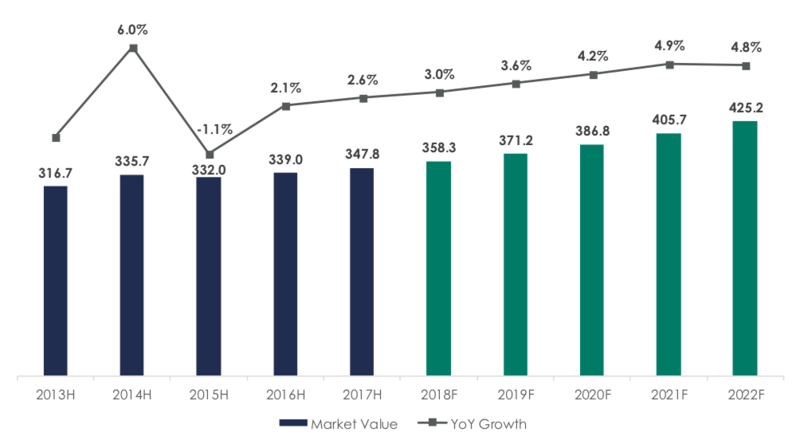 Turning to market size forecasts, consensus expects the global software market to grow to $425.2bn in 2022, with an implied 2017-2022 CAGR of around 4.1%. Currently, rivalry within the industry is quite strong due to both the presence of big-sized international incumbents and the high degree of flexibility characterizing the business, allowing new entrants to turn their alternative business models into not-negligible threats. On top of that, the pressure arising from the fast pace at which technological development occurs pushes companies towards increasingly competitive pricing strategies. Being Adobe-Marketo a US-US deal and being the US market, which represents 31.4% of 2017 global market value, the biggest in the world, a focus on the US software market’s key trends is required. Specifically, the US software market reported a 2.4% YoY growth in 2017, reaching a market value of $109.1bn. Future growth is expected to be even stronger, with a forecasted 23.5% 2017-2022 CAGR, bringing 2022 expected US software market value to $134.7bn. In terms of category segmentation, the US scenario reflects the same trends observed on the wider global scale, with software infrastructure being the predominant and more lucrative activity performed by American software houses. On September 20, 2018, Adobe Systems Incorporated entered into a Share Purchase Agreement with Topco, the indirect parent company of Marketo, and Vista Equity Partners Management. Adobe will acquire Marketo through the purchase of all the issued and outstanding shares of capital stock of Topco and other equity interests in Marketo, for an aggregate purchase price of $4.75 billion in cash, subject to purchase price adjustments. The cash consideration is expected to be financed with a combination of new debt and cash on Adobe’s balance sheet and the involved parties’ obligations to consummate the transaction are not subject to any condition related to the availability of financing. The transaction, which is expected to close during the fourth quarter of Adobe’s 2018 fiscal year, is subject to regulatory approval and customary closing conditions. Until the transaction closes, each company will continue to operate independently and Mr. Steve Lucas, the CEO of Marketo, will continue to lead the Marketo team as part of Adobe. To compete and win today, businesses in every category must place a laser focus on providing world-class, end-to-end customer experiences across every physical and digital touchpoint. While “Digital Transformation” has become the mandate for CEOs in every boardroom across the globe, consumers have set a very high bar for what constitutes a great customer experience and Adobe has successfully delivered to B2C companies cross-channel experiences that are personalized and consistent. However, reimagining end-to-end customer experience is critical also for businesses that sell to other businesses, B2B. With nearly 5,000 customers, representing enterprises of all sizes across industries that rely on its marketing applications to drive engagement and customer loyalty, Marketo brings together planning, engagement and measurement capabilities into an integrated B2B marketing platform. Adding Marketo’s engagement platform to Adobe Experience Cloud will enable the acquirer to offer an unrivaled set of solutions to deliver transformative customer experiences. The deal will boost Adobe’s cloud-based software offerings and allow competition with larger peers like Microsoft and Oracle. Furthermore, this combination will enable the supported businesses to acquire more customers through targeted, account-based advertising, will improve campaign creation and execution velocity with access to an intelligent repository of content assets, will deliver cross-channel experiences including web, mobile, email, in-store and in-person. Following the acquisition of Magento, the market-leading platform for open commerce innovation, the addition of Marketo to the Adobe family demonstrates the commitment of the company in enhancing the industry-leading platform and solutions, and will further strengthen the ability to provide significant business results for all the customers, from large enterprises to mid-market and small businesses. The transaction represents a momentous occasion also for Marketo, as the company’s exceptional lead management, account-level data, and multi-channel marketing capabilities will combine optimally with Adobe’s rich behavioral dataset to create the most advanced, unified view of the customer. The result will reveal an unprecedented level of marketing engagement, automation, and attribution power. Adobe will further accelerate Marketo’s product development, offering a new level of global operational scale, the ability to penetrate new verticals and geographies, and the access to an impressive enterprise customer base. From the perspective of Vista Equity Partners the success of the deal will generate a substantial payout, given that the owners of the tech company have acquired it for $1.8bn just two years ago. Adobe’s price after the Thursday 20th deal announcement was essentially unchanged, with the US software house’s shares reporting a 0.55% gain, closing the trading day at $266.34. For Vista Equity Partners, the transaction is set to generate a 2.6x return. Adobe appointed JP Morgan as financial advisor, while Hogan Lovells assisted the California-based software house in all legal matters related to the deal. On the other hand, Marketo and the selling shareholder – the private equity fund Vista Equity Partners – were advised by Morgan Stanley over all financial considerations, with Kirkland & Ellis acting as legal advisor to the parties.